The slides were at varied heights--the highest from the tippy-toppiness of the fifth floor. The Tate Modern was surprising as it was a mishmash of MOMA and MOCA--with some great Francis Bacons, Legers, Duchamps, etc. Nice show on covers of a russian magazine called Russian Construction with compositions and photography by the great El Lissistsky and Alexander Rodchenko. Saw some nice collages a la the good ones we saw at the Johnson Museum. Fell in love again with Francis Picabia...need to do some research on him. There was a Diego Rivera pastel that was truly 12 feet tall. The Duchamps was great--in the Philadelphia Museum of Art hand...not as extensive a group...but beautiful in real life. 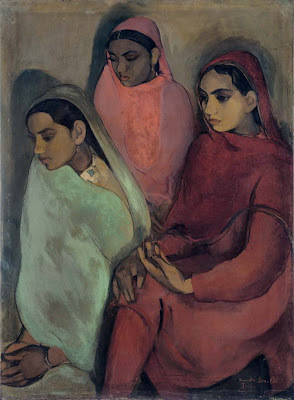 There was a show of the indian (as in India) artist, Amrita Sher-Gil --an indian version of Freda Kahlo. 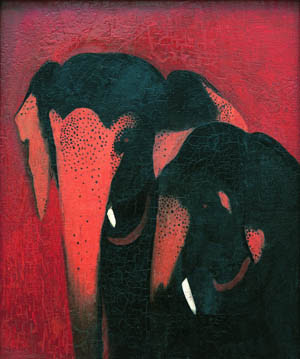 John Thompson knew all about her from his recent adventures in India where Sher-Gil is lauded as one of the "big" ones. She was turn of the century, and recognized as early as age 19 as a big talent. She was the product of a Sihk (sp) father and a hungarian mother--essentially raised in India but trained in Europe. She was inspired (and its pretty evident in her work) by Gaugain--even mimicing his work, composition and imagery in one of her pictures though her palette is very dour and dark. The image above is during a transition time in her work--and I find it interesting per the Burka images. My favorite installation was a new piece the Tate has acquired called "Sliding Doors" which would be perfect for CMoG. One approaches the piece which is a wall covered in mirrors with a mirrored sliding door. The door automatically opens and you face another mirrored wall with a sliding door --about 3 strides takes you from one door to the next...and this happens about 7 or 8 times. It is stunning and startling and dizzying. Glass. Mirrors. Motion. Passage. Totally excellent. And, a real crowd pleaser. Traci rode the slide and bumped her head. She said the slide was not too fun. Great stuff at the store..but expensive. I was tempted but did not give way on an industrial weight felt bag....but I have enough bags for my life and twenty others...so I resisted. But I did buy some postcards. The Tate Modern as a building is very cool. Terrific spaces. Tons of escalators. Lots of peeks through to other spaces. Wonderful plantings of very skinny birch trees you have to walk and look through prior to getting to the building. The Tate Modern and Tate Britain run a boat (can you imagine? it is called the Tate Boat) between both locations. It takes twenty minutes...and I love the idea. Back at the Faraday House after a lunch at Pret as both Traci and I hoped. We will see an illustrator/graphic designer at 2:30 and then have time. I am going to see the Beatrix Potter illustrations at the British Museum.